I'm still trying to figure out the statement at last Wednesday's informational meeting by Forest City Ratner VP MaryAnne Gilmartin (video below) that the office tower known as Building 1 (B1) would be 620 feet tall. It just doesn't compute. Nor does her statement that one residential building would be 428 feet. [Updated] And I wasn't able yesterday to get FCR or the Empire State Development Corporation (ESDC) to clarify their expectations of the building heights--though this morning an ESDC spokesman says, "The GPP accurately states the maximum allowed height of each tower." Gilmartin was reading from a document, apparently (as noted below) one issued in July 2006 rather than December 2006. Both, which claim the building would be 620 feet, are in some ways out of date. 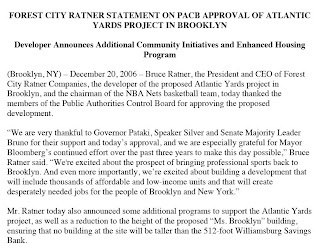 Notably, Forest City Ratner, in a December 2006 statement (left) accompanying project approval by the Public Authorities Control Board (PACB), agreed to "a reduction to the height of the proposed 'Ms. Brooklyn' building, ensuring that no building at the site will be taller than the 512-foot Williamsburg [sic] Savings Bank." As I wrote in May 2008, new renderings by Frank Gehry were reported as showing the tower at 511 feet. That change, however, was not and has not been memorialized in project documents issued by the Empire State Development Corporation (ESDC). Also, one of the residential buildings was chopped nearly in half. That was memorialized in project documents, though Gilmartin spoke as if that never happened. I think Gilmartin was most likely simply reading from the wrong document. Had she been correct about the height of the residential building, I might have said she was maintaining a convenient fiction, one in which the 2006 Modified General Project Plan (GPP) remains essentially unchanged, except for amendments regarding the acquisition of the project site in stages; a deferral of payments for the Metropolitan Transportation Authority (MTA) site; and a revision of the deal to upgrade the MTA's Vanderbilt Yard. 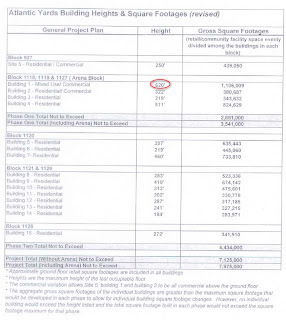 After all, on page 51 of the 2009 Modified GPP, a document titled Atlantic Yards Building Heights and Square Footage (revised) indicates that B1 would be 620 feet. It's the same document that appeared in 2006. Then again, maybe 620 feet is the ESDC's maximum height, while 511 feet is simply Forest City Ratner's maximum height. Perhaps the document, even if misleading, passes legal and administrative muster. [Update] That's my reading of the spokesman's statement this morning. The height of the buildings will range from approximately 190 feet to 511 feet. Building 1 (B1), the building proposed for the corner of Flatbush and Atlantic Avenues, will not be taller than the nearby Williamsburg Savings Bank, which stands at 512 feet. Separate from the Atlantic Yards development, building heights as high as 600 feet have been approved by the City Council as part of the Downtown Brooklyn Plan. "The first residential building is 34 stories. The second residential building is comparable to that," Gilmartin said last Wednesday, adding, "Building 2, which is the first residential building, is 322 feet. Building 3, which is the second residential building, is 428, and Building 4, which is the third residential building, is 511 feet." Hold on. As the first document on building heights indicates, Building 2 would be 219 feet tall, not 428 feet. Gilmartin was apparently consulting a July 2006 document (right) accompanying the General Project Plan, which was revised into the Modified General Project Plan before ESDC approval in December 2006. 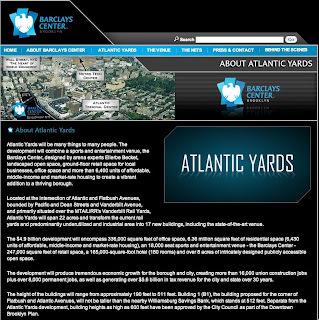 Shouldn't Gilmartin, more than anyone else, know the heights of the buildings planned for Atlantic Yards? Building 3, located on the Arena Block at the corner of Dean Street and Sixth Avenue, is proposed to rise to a height of 428 feet and contain approximately 530,000 zoning square feet. The composition of the Arena Block’s four buildings was carefully analyzed, and the Commission believes that Building 3 creates an excessive building wall which diminishes the prominence of the arena’s location. 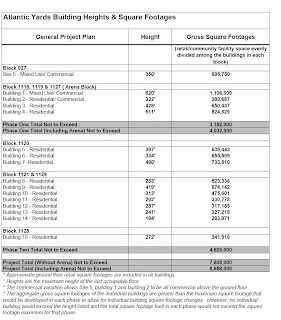 The Commission therefore recommends that the height of Building 3 be reduced to approximately 220 feet and approximately 275,000 zoning square feet, to provide a stronger composition of buildings surrounding the arena, and to better reflect the existing built context of nearby buildings.